If you have ever been boating, then you know that an hour into your outing you have a big pile of wet life jackets in your boat! This pile not only takes up valuable space but creates a tripping hazard to boot! Worse than the clutter, is the fact that putting on a cold, wet life jacket every time you get back in the water is awful! 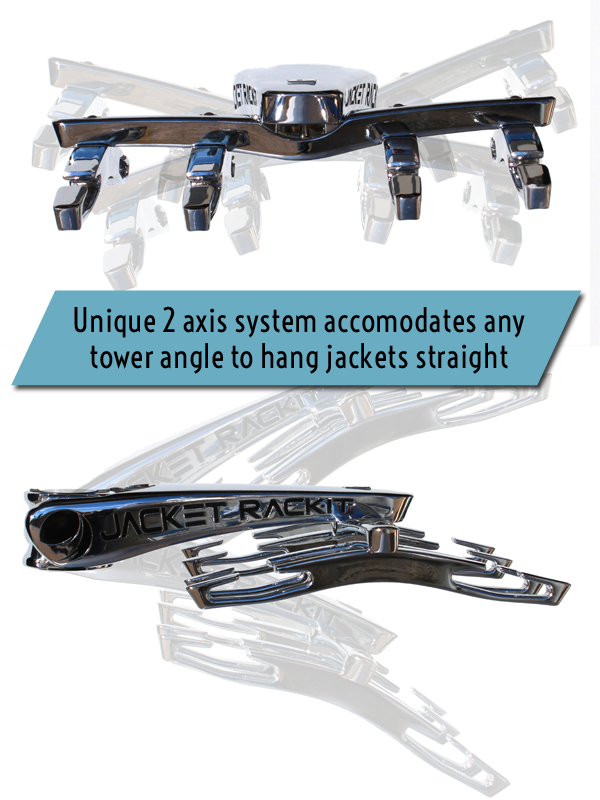 That is why we developed the Jacket Rack-It boating accessory! Dries life jackets in just minutes! Safely stores life jackets outside the boat to eliminate clutter and tripping hazards. Easy to use and installs in minutes! Does not interfere with other tower accessories. Can be installed below other accessories, such as wake board racks. Holds up to 4 adult or child size life jackets. Made of strong and corrosion resistant chrome plated aluminum and stainless steel hardware for security and durability. Non-marking rubber inserts allow for mounting to various tube tower diameter widths without scratching the tower. Adjusts to all tower angles with “adjustment axis points” to keep the rack level. Measures approximately 21”x17.5” and weighs 17 lbs. Installs on most boat tube towers with diameters between 1 3/4” - 2 1/2”. Q: Will my life jacket hang into the water? A: Nope. Even if your boat sits low in the water the rack can be adjusted so the jackets don't get wet. Q: When I make a sharp turn will the jacket get wet? A: Depends on how you install the rack. If you install it too low and you make a sharp turn then you might get the bottom wet. Just make sure you install it high enough. Q: How fast can I go with the jackets on the rack? A: We have tested them at 40mph and the jackets gently flow through the air without flapping. We definitely recommend you take the jackets off before you tow the boat home on the highway though.